Ammonia produced by rabbit urine is unpleasant for humans to smell but is dangerous to your rabbit's health. Persistent high levels of ammonia can damage the delicate nasal passages of rabbits. The nares in the nose that filter out pathogens become damaged and often respiratory disease follows. For people who keep their pets in the house I recommend a pelleted type of litter made from Aspen, Kiln dried Pine, Wheat or straw. We use and sell Kiln dried Pine pellets manufactured by Eagle Valley and find them to be very odor absorbent and actually smell good when wet. You can use it in a litter pan or in the tray bottom. We have a wonderful product called "NIX". Pleasant soapy smell. It is a biological odor control agent not a masking agent that simply covers up odors. 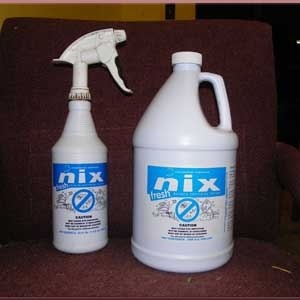 Nix is a combination of liquid live bacteria and biological enzymes that immediately attack odor-causing substances and destroys them by bacterial action. It is non-polluting, non-toxic and non-alkaline. It acts WITH nature not against it! For rabbits kept in an enclosed barn or shed the ammonia levels can be very high, especially in winter when we close doors and windows to prevent drafts. I recommend running fans at floor level on low all year to help move the ammonia out of the building. Rabbit facilities should all have ventilation at floor level as well as overhead to maximize air flow and prevent illness. The other critical issue in reducing ammonia is to clean floors and trays several times a week. Using shavings in trays can often trap ammonia but not allowing the air to dry the urine. We do not use anything in our trays but we empty them every 2 days and sweep the floors daily. We spray NIX in trays after they are cleaned and on the floors every 10 days. No system is perfect but we are obligated to protect the health of our herd at all times.